Straight on TargetÂ This air-cushioned target features padding 5 1/2â€ thick to withstand your most punishing straight-on punches. Target diameter is 10â€. Leaf Spring TargetÂ This target combines the resistance training of a heavy bag with the accuracy, speed and combination training of focus mitts. The spring-loaded target rotates 360 degrees with eight lock-in positions providing the perfect angle, for all your strikes. Floor StandÂ The Focusmaster Floor Stand is the perfect answer for those who are not able to mount the G-1000 to the wall. The new Floor Stand design comes with an XXL water tank and (4) four self-leveling foot pegs. 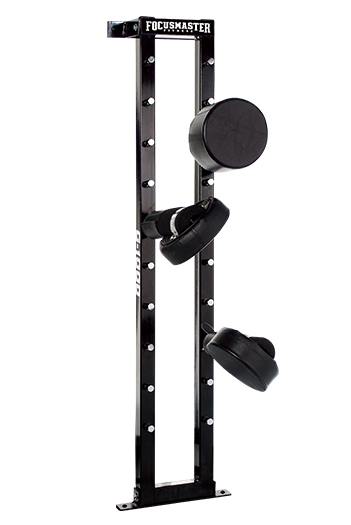 The floor stand also comes with mounting hardware allowing you to bolt it to your floor. The Floor Stand takes up half the space of a treadmill, with a 90cm x 90cmâ€² footprint. Torso Pad This 37.5cm long, 30cm wide, half round body target is perfect for your best body punches. The Torso Pad is not a kicking target. It is best used as an accessory to your Leaf Spring and other targets to create a solid rib cage for heavy body punches. Extender BarÂ The Extender Bar allows you to spread your targets 75cm apart for wide opposing hook punches, kicks and more. It offers a wider range of possibilities and includes two inner studs for two Coil Spring Arms if you want to create a spring loaded Wing Chun Dummy when in use with your Straight-On Target. Coil Spring ArmÂ Everybody needs at least one Coil Spring Arm with their G-1000. The stiff coil spring action creates endless training possibilities, from trapping, blocking, simultaneous attack and defence drills, to using it for sweeps, high crescent kick-throughs and much more. Clapper TargetÂ The Clapper Target is a softer target with a separation down the middle. When struck properly, the target makes a satisfying â€œclap!â€ This target is great for those who are just learning to strike properly, as it has much less resistance than the Leaf Spring Target. Inspired by the traditional clapper targets used by martial instructors everywhere, developed with thicker padding, better sewing, and construction that doesnâ€™t sag like traditional targets.